Jeremy once told me that I was the most resourceful cook he knows. This is because I never start a meal plan for the week by deciding what I want to make, then writing down ingredients. Instead, I go to the pantry, freezer or fridge, see what random left overs or items we have, then plan our meals around that. Because most of what I cook is done without recipes, this works for me. And that’s the beauty of learning techniques versus recipes. If you know how to make a basic cream sauce, or the components of a risotto or the technique of braising meats, then you don’t need recipes. What I find to be most important is the concept of ratio. So if you know that a basic risotto calls for 1 part rice to 4 parts liquid, then you’re fine, and you can experiment to your hearts’ content without worrying about if the rice is going to dry up or if it’s going to be too soupy. So this past week we had some kind of random things sitting around. First off, my sage plant has exploded this fall, so I wanted to use some fresh sage. I also had a huge bag of pistachios left over from camping and a half of a container of Parmesan….some of you know where this is going already: pesto! Pistachio-Sage pesto. Because, once again, if you know the basic components of pesto (basil, Parmesan, pine nuts, olive oil) you can swap each of those ingredients out for something similar (sage, Parmesan, pistachios, olive oil). I also had a huge FIVE POUND bag of quinoa that I got at Costco the other day, as well as a side of salmon that I had cut down into fillets and frozen. Finally there was a random butternut squash that I had picked up at a farm and sort of neglected. I wanted to experiment with the idea of quinoa risotto. Normally risotto is made with Arborio rice, a super short-grain rice that cooks almost like a pasta. It’s cooked slowly, adding small amounts of liquid, which are then absorbed before adding more, and of course – stirring the entire time. 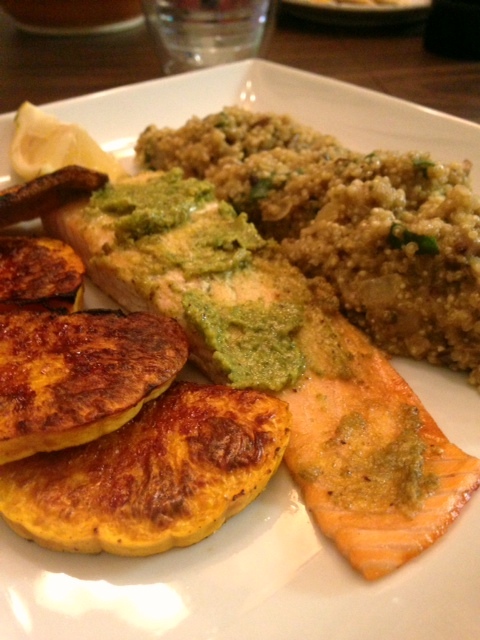 Quinoa is also a grain and is …. not “short” but small, let’s say. I wasn’t sure if it would cream up like Arborio, which slowly releases its starch as it cooks, creating its own creamy sauce when combined with water, broth, wine, etc. But I figured it was worth a try. Make the pesto by combining 1/4 cup of pistachios (shelled) with a palm full of Parmesan, a hearty bunch of sage (chopped), the juice of half a lemon, salt and pepper in a food processor. Pulse the ingredients while drizzing olive oil through the top until a nice thick paste forms. little lemon zest and saute until soft. 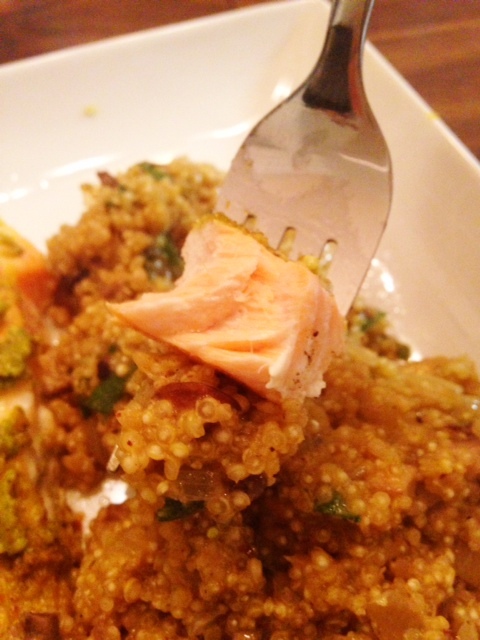 Add in one cup of quinoa (or Arborio rice) and toast the quinoa until it starts to brown. 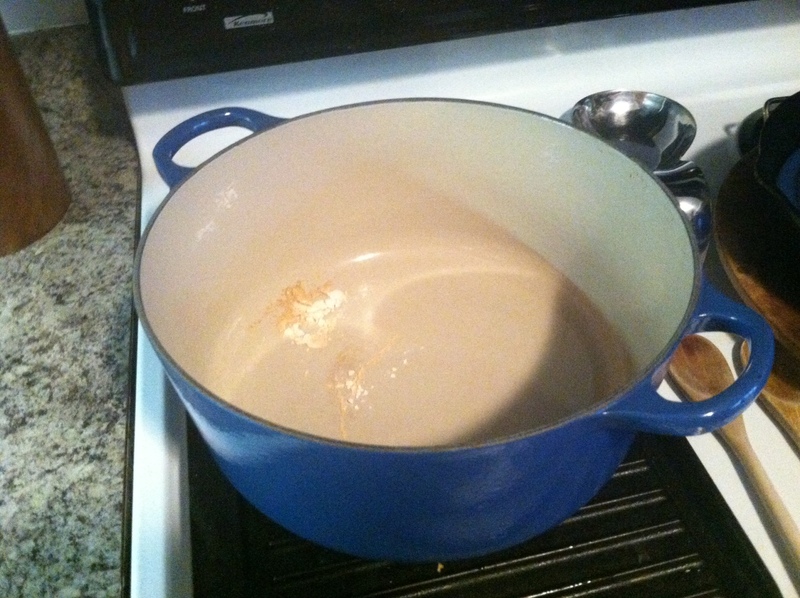 Pour in half a cup of chicken broth and use this to deglaze the pan, and stir until it is absorbed. Continue to add half a cup of broth at a time, stirring until absorbed until you’ve reached the consistency you want. You’ll likely use less liquid than you would with a true risotto. I used about two cups of broth to one cup of quinoa. It will take about 15-20 minutes to get the quinoa cooked through. You know when quinoa is cooked because the grain sort of pops open. It’s impossible to describe, but immediately obvious when it happens. When the risotto is close to being done, within the last few minutes, add the juice of half a lemon and a large spoonful of the pesto and stir in. About 10 minutes before the risotto is done, coat some salmon fillets with your pesto and put on a baking sheet in the oven with your squash. Bake the salmon for 10 minutes of until it flakes easily with a fork. Serve it up! Top the risotto with a little more Parmesan and top your salmon with a bit more pesto. 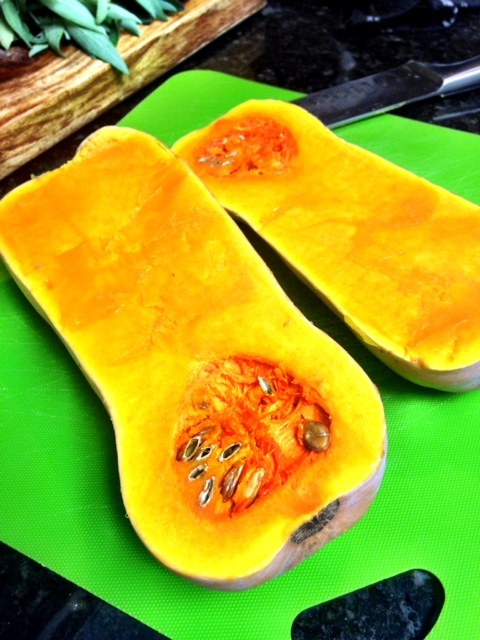 Your squash should be a little crispy on the outside and cooked through on the inside from roasting. Serve with a lemon wedge to brighten up the salmon and risotto. Enjoy. And use these steps to make something completely different – based on whatever you have on hand. I’m sure many, if not most, of you have heard of Pinterest. 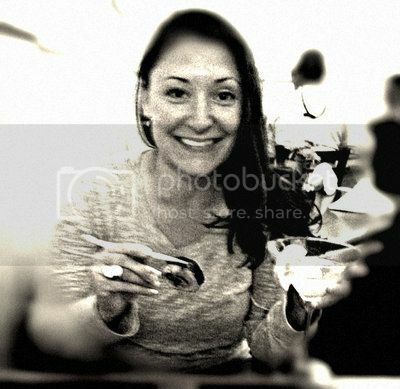 I first heard about this little site where you could “curate” your own visual boards over two years ago when the site was still in Beta testing. I did some quick research on the trusty interwebs and lo and behold, I was able to track down the Pinterest CEO to his person twitter page, where I began a barrage of direct messages begging for a beta tester invite. I got it. His name is Ben, by the way, and he’s super nice. I was one of the first few thousand people to use the site, and use it I did. I currently have over 30 boards, 981 pins and 125 followers. When Pinterest first started it was much more of an art and design crowd. The cool kids who were developing the site had no doubt invited their other cool kid friends who I’m sure were all interior designers, graphic artists, and web developers in San Francisco (that’s where the company is based, not the valley, which is why the site and its people are so cool) to give it a whirl. As Beta opened up to user invites, and the site became a real, live thing, it became much, much, much more crafty, crock potty and crap to do with your kidsy. But you know what? I still love it. Despite the fact that I have to sift through hundreds of pins of maternity photo sessions to get to the thing I’m looking for, despite the fact that when I search the food category I have to ignore a million recipes that suggest throwing four different kinds of canned Campbell’s crap into your slow cooker and feeding it to your family of 10 for less than .30 cents a serving, I still think it is an awesome, amazing thing. And every once in awhile, you run across some real gems. On Wednesday of this past week, I made THREE recipes for one meal that I found on Pinterest: A Roasted Garlic salad dressing, a rosemary and Parmesan overnight bread, and an Italian style beef and butternut squash stew. They were all the kind of things that keep me obsessed with the site. Diamonds in the rough. The Roasted Garlic Vinaigrette is a MUST try to anyone who loves garlic on the level that I do. Two heads of garlic go into this dressing. And while you do have to roast the garlic for a good half hour, the dressing itself is really easy to make, and you probably have most of the ingredients on hand. 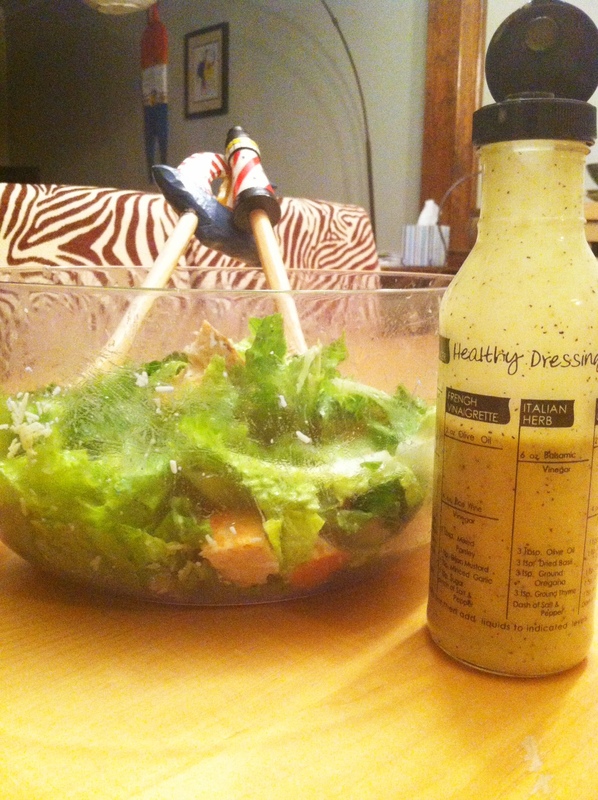 I’m currently obsessed with making my own salad dressings and have tried several I’ve found on Pinterest, but this one is my favorite. Cut the pointy top off of the garlic. Brush them with olive oil and roast them in a pan in the oven at 400 degrees for about 25 minutes, until it is starting to turn golden brown and soft. Remove from the oven, allow to cool. Once the garlic is cool, peel the skin off. Discard the skins, save the garlic. *Skin peels off really easily after they are roasted. Add all the ingredients to the food processor and process until smooth. Refrigerate until ready to serve. *If some of the skin get processed with the rest of the dressing, no big deal, it won’t change the flavor. The salad dressing can be vegan if you sub the honey for agave. And it is dairy free, with no substitutions! This dressing is tangy, but has that deep, rich caramelized taste from the roasted garlic. It’s a vinaigrette, but it’s creamy because of the garlic being processed right into it. Keep this for a week or so in your fridge in a covered container. OK, enough about my awesome piece of iron. Here’s the recipe. In a large mixing bowl, whisk together flour, salt and yeast. Add water and mix until a shaggy mixture forms. Cover bowl with plastic wrap and set aside for 12 – 18 hours. Overnight works great. Heat oven to 450 degrees. When the oven has reached 450 degrees place a cast iron pot with a lid in the oven and heat the pot for 30 minutes. Meanwhile, pour dough onto a heavily floured surface and shape into a ball. Cover with plastic wrap and let set while the pot is heating. Remove hot pot from the oven and drop in the dough. Cover and return to oven for 30 minutes. After 30 minutes remove the lid and bake an additional 15 minutes. 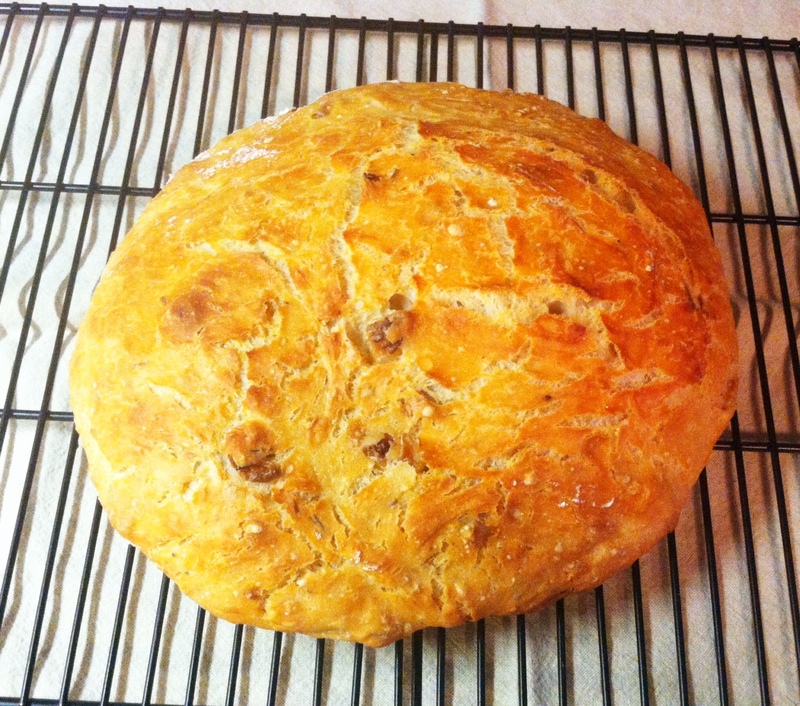 Remove bread from oven and place on a cooling rack to cool. To this recipe, I added 1/4 cup of fresh grated Parmesan Cheese, 1/8 cup of fresh rosemary (from my garden), and several cloves of smashed and roughly chopped garlic. I added that in to the dough at the very beginning and then proceeded as normal through the recipe. This thing turned out beautiful. 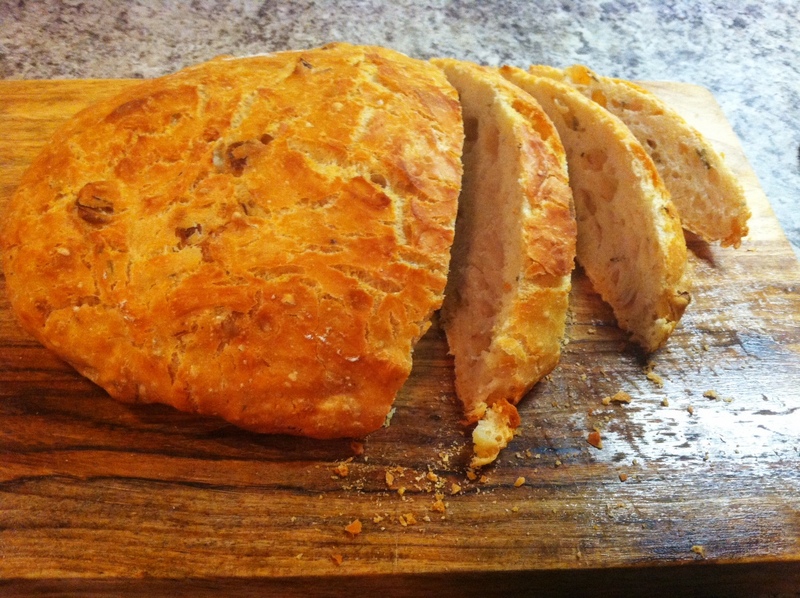 There is nothing quite like making your own bread from scratch and this is really a pretty easy way to do it. 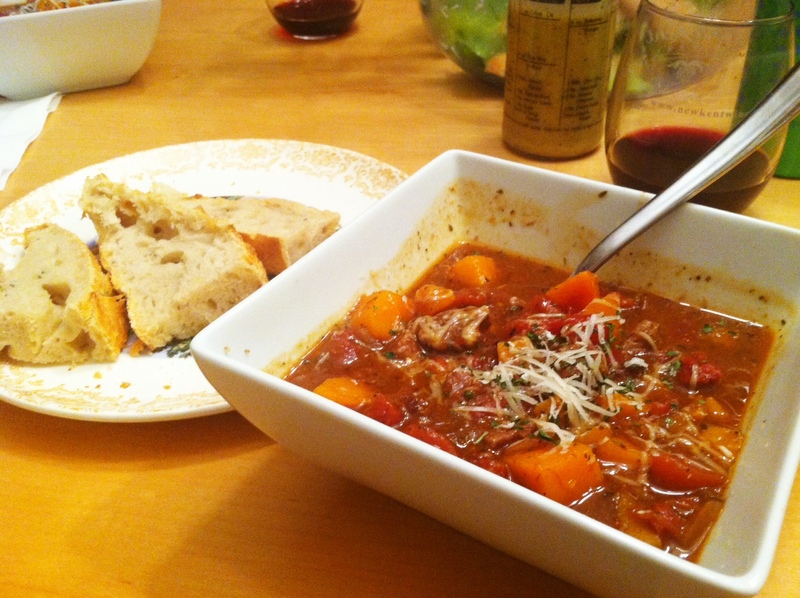 Finally, the main course – Beef and Butternut Squash Stew from Closet Cooking. I’ll be honest and say there are a few things wrong with the way this original recipe is written, so the recipe below has a few very minor changes from myself, just to make things more clear. 1 (28 ounce) can diced tomatoes (My Note: He doesn’t specify drained vs. undrained. Because he does not, I put them in without draining them. 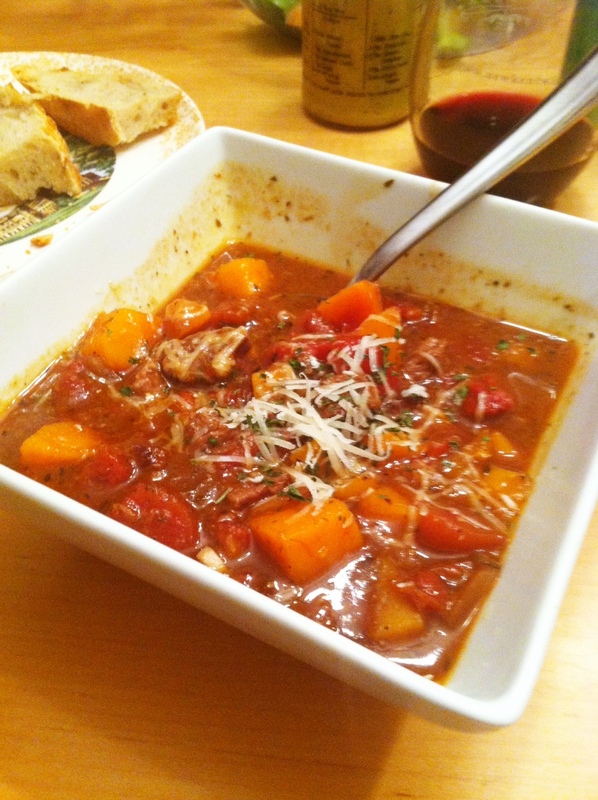 It gave my stew a more “soupy” consistency, which I was OK with. If you want this to be more like a traditional stew, then drain the tomatoes before adding). parsley (chopped) (My Note: optional for garnish. I used a bit of grated Parmesan instead). Add the beef and brown on all sides in the grease from the pancetta and set aside. (My Note: I coated the beef cubes in flour first. I’ve always done this when searing beef that is basically going to be braised later. It also helps to thicken the sauce a bit, but it’s up to you). Add the onion and saute in the pancetta grease until tender, about 5-7 minutes. Add the garlic, red pepper flakes, rosemary and thyme and saute until fragrant, about a minute. Add the wine and deglaze the pan. (My Note: deglazing means you add a liquid to absorb the browned bits from the pancetta, beef and aromatics. When you add the wine to the hot pan, it will steam up. Take a wooden spoon and use that moment to scrape up all the bits in the bottom of the pan, stirring them into the liquid to create a flavorful base). Add the beef, broth, balsamic vinegar, sun-dried tomatoes, diced tomatoes, parmigiano reggiano rind, oregano, salt and pepper and bring to a boil. Reduce the heat, cover and simmer until the beef is nice and tender, about 1-2 hours. Add the squash and simmer until it is tender, about 15-20 minutes. (My Note: more like half an hour, at best). This stew was filling, hearty and really quite healthy. Serve it with a glass of the same wine you used in the soup – superb! Always cook with wine that is good enough to drink. When you cook with wine, you are cooking off the alcohol, but intensifying the flavor. If you intensify a crappy wine, you will just get really intense crap. No Bueno. The dressing, served over a bed of Organic romaine lettuce, the garlic, rosemary and Parmesan bread and this stew altogether? Perfection. Pinterest Perfection.